Continuing on the theme of glass-less 3D displays mentioned a few days ago, The Register reports that Apple has patented a 3D display system that requires neither special glasses or ‘parallax’ screens that enables “inexpensive auto-stereoscopic 3D displays that allow the observer complete and unencumbered freedom of movement.” The system’s concept revolves around the use of a combination of eye-tracking and a reflective display that monitors the position of the user and bounces the image from a projector so as to split 3D content for the left and right eye. 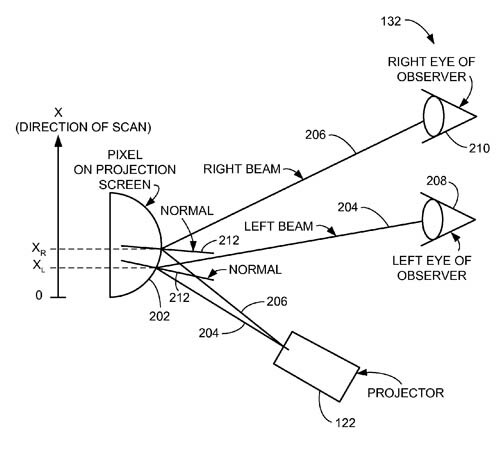 Apple’s effort is to first track viewers’ position and movement, and then use that information to guide the projection of pixels onto “a projection screen having a predetermined angularly-responsive reflective surface function.”. Each projected pixel is beamed onto a textured, reflective surface and reflected to the eyes of each viewer, separating left and right views and therefore producing a 3D effect. The projection angle changes according to the input of tracking sensors detecting user movement in relation to the screen. Apple assures us that it “valuably supports and services the historical trend of reducing costs, simplifying systems, and increasing performance”. We could not agree more on this philosophy. What remains to be seen is whether Apple will actually realize such designs. We say they will. Technology Review has a nice post on the current state of the mobile phones industry, with emphasis on the social implications. You can find it here. While reading it I was thinking of the time when mobile phones were not as smart as today, PDAs were much simpler than the cheapest phones of the last five years, I was building my first wearable computer and was holding Open Day AR demonstrations in the University of Essex. I remember the groups of parents that came to see the work done in the Vision and Synthetic Environments (VASE) Laboratory and how impressed they seemed, whenever I told them that the computers of the future will be our mobile phones. Small, context-aware, pro-active, always tethered to some form of network and operational for large periods of time. Of course, this was not my prediction but more or less what all researchers in mobile, wearable and ubiquitous computing envisioned back in the previous couple of decades. The article from TR summarizes the current state of mobile phones, mentioning how all of the aforementioned ‘features’ and how they are currently being encountered. Notably, as Jaffrey Rayport, the article’s author states, we are outsourcing our memory to our devices. More and more information, like phone numbers, addresses, location notes and task-lists are stored in those tiny gizmos instead of our head. Our decisions are often automated through criteria based searches where as our collaboration and communication patterns are much more immediate compared to the past. This is indeed the era of mobility. An era where we are not anymore pinned to a location but mobile, unthethered and immersed in a cloud of information. Instead this time, the information that concerns us is pinned to our environment. Kind of like the notice board, back in the university, during those demonstration days. IEEE Spectrum has a very interesting article on HMD/Glass-less 3D systems on its December 2010 issue. You can read it here. The article presents past and recent efforts on creating 3D displays without using spectacle-type displays, discussing various techniques. We find the possibility of having 3D displays without the whole – arguably obtrusive – arrangement that comes with HMDs, quite fascinating. Some of the recent HMDs are indeed small and quite comfortable but at the end of the day we feel it would be more intuitive and… well, normal, not to wear them. Nonetheless, as we understand it, the current systems work on a number of assumptions – such as distance from the screen, inter-ocular distance, posing certain usability restrictions. Among the companies mentioned Nintendo, for example, offers some adjustment for such variables in their prototypes in an effort to rectify these issues. Presumably an active (or real-time re-) calibration of the system could offer some transparency and independence to the user but that is a research subject on its own. Moreover, the techniques presented in the feature are governed – once again – by quality-cost-power consumption trade-offs, with obvious consequences on mobile usage such as portable game consoles or smart-phones. Still, the concepts are there and people keep pushing technology and that is the only way to go. One aspect of 3D HMD displays, that the article comments on, is the ocular and non-ocular effects that often come as a result of HMD usage. In fact it is one of the aspects we on our past research efforts have examined to some extent. These issues, most often headaches and less often nausea and vomiting, are a true limitation of HMDs. Top that with with focus, luminance (for outdoor use), resolution, ghosting etc, things get messy quite fast. It is surprising – well maybe not so much if you want to be cynical – that people do not mention these limitations when talking about ‘AR-hype’ . Arguably, the focus today is on handheld mobile AR, but nonetheless these limitations are present for years and researchers have investigated them to a large extent, particularly in the context of military simulators. We know you can not market something when you focus or mention its problems (the aforementioned cynicism…) . As UX researchers though, in a broad sense, we need to take these things into consideration if we want to produce truly immersive and commercially successful systems. Probably the most impressive examples of AR I have seen in a while. Finnish VTT Team has done some impressive work in the past and this example is nothing sort of spectacular in my book. The video was recorded a Dell laptop with a Quadro FX 3700M video card,﻿ a Core Duo processor and a basic Logitech webcam. The graphics itself is drawn using OpenGL and GLSL. Photorealistic rendering for Augmented reality. Uses soft shadows, indirect lighting and image quality matching. Various materials like glass, chrome or plastic are possible. Lighting is automatically determined from a ping pong ball. For us it is a demonstration how realistic things can appear with modern hardware – albeit not of the ‘handheld’ type – and GFX APIs, hinting that the more we push the envelop and exploit technological advancement, the more immersive things will appear. Kat Austen in New Scientist’s Culture lab presents a very interesting post on AR books. By AR books we – currently – refer to books that have some added information in the form of extra visuals which are projected through a a web-cam-equipped computer, tracking the book’s features, such as pictures, QR Codes etc. The post mentions some of the books that appeared this year, such as Fairyland Magic from Carlton Books and Tyrone the Clean’o’saurus from Salariya Publishing and presents the author’s experience with them. Kat also mentions Camille Sherrer’s Souvenirs du Monde des Montagnes along with a video bellow. We cannot help but agree with the author’s overall assessment that, overall, the current AR books have an element that makes them impressive initially but they eventually lose their grip on the reader – particularly the young ones. Moreover, the set-up required usually to achieve those augmentations is not exactly convenient, especially when you simply want to ‘dazzle’ your kid with an elaborate story. It so happens that this is our view on many matters of current AR. Things are impressive on first sight but when you pass the ‘wow, what’s this!’ point, they often fall short. We are planning to investigate in the future, the sense of immersion of various AR book paradigms through user assessments.